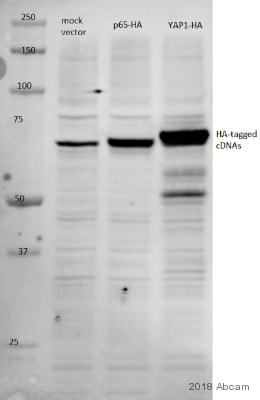 Rabbit polyclonal HA tag antibody. Validated in WB, IP, ELISA, ICC, Flow Cyt, ChIP, ChIP/Chip, ICC/IF. Cited in 509 publication(s). Independently reviewed in 53 review(s). ELISA: The anti HA diluted 1:70.000 gave an O.D.=1.0 in a 15 minute reaction against peptide conjugated with a different carrier than used for anti peptide purification. 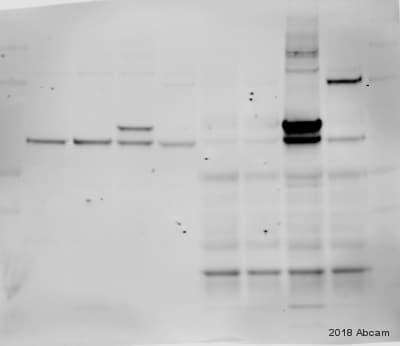 HRP conjugated Goat anti rabbit IgG was used and TMB was the substrate. YPYDVPDYA (influenza hemagglutinin-HA-epitope) conjugated to KLH. 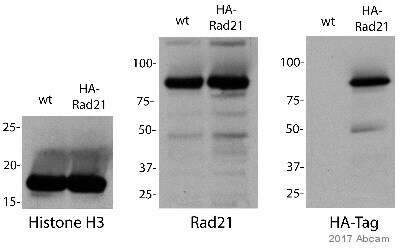 WB: 293FT cells transfected with 15kDa HA tagged Vpr (an HIV1 accessory protein). IP: Nuclear lysate of HEK-293T cells transiently expressing HA-tagged protein. ICC/IF: U-2 cells. Mouse olineu cells. ChIP: Xenopus laevis oocytes were injected with mRNA for HA-tagged human BORIS. Our Abpromise guarantee covers the use of ab9110 in the following tested applications. ChIP Use 3 µg for 25 µg of chromatin. 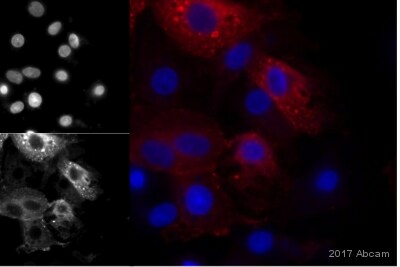 Xenopus embryos were injected with 500 pg pkcα-gfp RNA and co-injected as indicated above the images. Animal Caps were prepared at stage 10 and immunostained as indicated. Nuclei were stained with Hoechst 33258 (blue). Images show representative results from at least two independent experiments with a minimum of six Animal Caps per experiment. Scale bars: 50 µm. 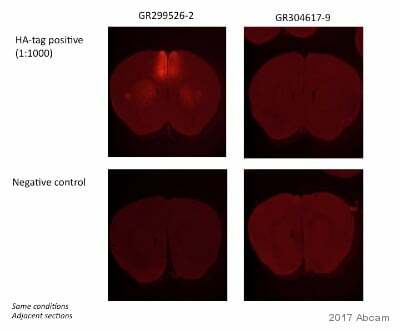 The inhibitory effect of Arrb2 MO1 (E) on PKCα-GFP membrane translocation was rescued by (F) co-injection of HA-Gβ and HA-Gγ mRNA (anti-HA (red): F′, merge: F"). HA was detected with ab9110. ab9110 was diluted to 4 µg/mg lysate and incubated with a nuclear lysate of HEK293T cells transiently expressing HA-tagged protein and a Protein A matrix for 2 hours a 23°C to achieve immunoprecipitation. 1000 µg of lysate was present in the input. 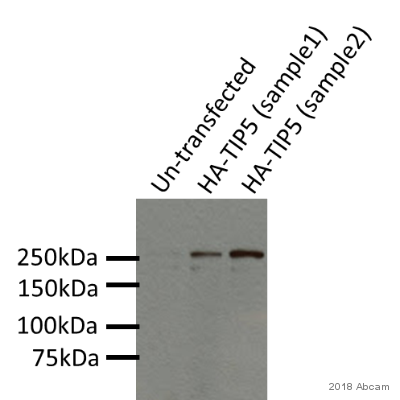 A HRP-conjugated anti-rabbit HA monoclonal antibody diluted 1/1000 was used for the Western Blot step. This image was kindly supplied as part of the review submitted by Kasper Fugger. 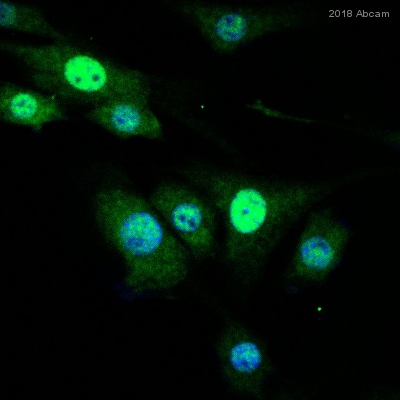 Immunofluorescence staining of U-2 cells expressing HA-tagged protein with ab9110. Xenopus laevis oocytes were injected with mRNA for HA-tagged human BORIS. 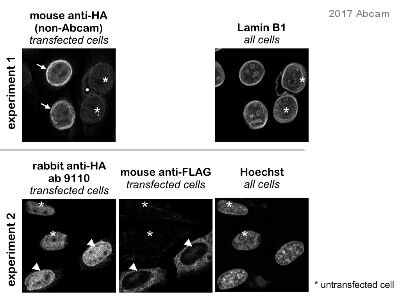 Chromatin was prepared according to the Abcam X-ChIP protocol. Oocytes were fixed with formaldehyde for 10min. The ChIP was performed with 25µg of chromatin, 20µl of Protein A/G sepharose beads, and 3µg of ab9110 (anti-HA, light blue) or, 3µg of ab18337 (anti-Boris, dark blue). A non-specific antibody was used as a control (yellow). The immunoprecipitated DNA was quantified by real time PCR (Taqman approach). ab 9110 at a 1/200 dilution staining the mouse olineu cell line (oligodendrocyte precursor cell) by immunocytochemistry. 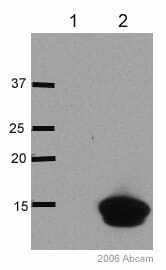 The antibody was incubated with the cells for 30 minutes and then detected using a Cy5 conjugated goat anti-rabbit antibody. Publishing research using ab9110? Please let us know so that we can cite the reference in this datasheet.